I’m in a “500 Words a Day” group on FaceBook that’s pursuing what it says in the name, every day in October. Since I have a streak going on 750 Words already, I’m going for a blog post every day in October in addition. (Minus a few travel days later in the month, probably). They’ll be a lot fewer than 500 words a day, but I love everyday journal-blogs and miss the days when I had one. 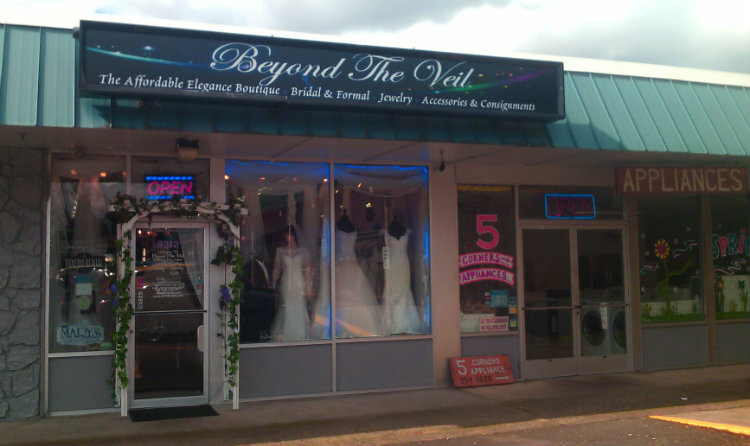 In addition to its Pinkwater-worthy name, Beyond the Veil has a full size range of sample dresses! unlike the three Portland shops I called first. C’mon, people, fat bridesmaids are a legit customer base! Anyway, they rock and I am almost sorry that my trips to Beyond the Veil (three in all) are concluded. finished Bil Wright’s Sunday You Learn How to Box, which I think is the earliest YA novel about a black gay boy that I’ve found, even though the pub date is a late-feeling 2000. But the book is set in the late 1960s and has a feel of that era in its sparseness and dialogue– it reminded me a bit of It’s Like This, Cat. So many pay phones! I surprised sanguinity this morning with a skill from my past– a practiced runway walk, complete with stop, pivot, and graceful gestures at features of my clothing as they are described by the narrator (who was also me). I learned it in 4-H, because we had a fashion show every year to show off the clothes we sewed, knitted, and crocheted. Granted, mine is the smiley midwestern version, more A Dream For Addie than Project Runway. But then, I was modeling a Rick-Rack Rhapsody navy-blue t-shirt from JCPenney. Frump Power! You guys, I bought a dress for my sister’s wedding next May! See photo below. 1. A seven-dollar “security dress” from Goodwill that met color requirements and was wearable, but had unfixable fit problems that I’d have to wear a wrap to cover. I bought it first thing in the morning to give me the courage to say no to anything else that wasn’t quite right. 2. A business card with handwritten details about a dress I tried on and whose clone I could order if I gave the shop 16 weeks’ notice. It would be sewn from fair-trade silk from the mill in India they work with exclusively, would be handmade in Portland, and said to me in the mirror, “Hello, I am the Platonic ideal of the bridesmaid dress you and your relatives had in mind!” The fabric was so light that it was like slipping into a cocoon. For all that, I was not wholly in love with it (there was a tie in the front that looked great when the shop attendant tied it, but weird when I tried) and wasn’t sure I would wear it enough to earn out the daunting figure on the price tag. 3. A lovely pair of palazzo pants, the kind that look like a long skirt as long as one is standing still, in blue-purple-gray. An impulse buy, attributable partly to the hard work of the saleslady bringing me outfit after outfit to try on, and partly to my being pretty sure I’d wear them a lot no matter what. And it was always possible I’d find the stunning top that would overcome my qualms about showing up as The Lesbian In Pants. The next week, I tried a few places in Southeast. Most notable was a store by the Hawthorne Bridge that apparently specializes in pageants and proms. I went in with Sanguinity and Bookherd, and as Bookherd said, there was no place to stand. Big circular racks of big circular dresses all around, and the store was mobbed with high-school-age girls in groups and their mothers. I remember some squealing, but I might be making that up. I was told I needed an appointment to try anything on, booked, and dismissed. (Later I called and canceled my appointment, because as far as I could tell all the dresses there had sequins and sparklies and would be completely over the top for me. There was still someone there at 10 p.m. when I called. That place is intense.) Out on the sidewalk, we were all a little dazed, and decided to adjourn for pho. Meanwhile, my mother-in-law had emailed me to suggest David’s Bridal, a chain that seems able to outfit a passel of bridesmaids in cute dresses at reasonable prices. Confident that I had begun to gain experience in both full-service shopping and the bridal-industrial complex, I headed to Clackamas with Sanguinity as soon as they opened on Saturday. 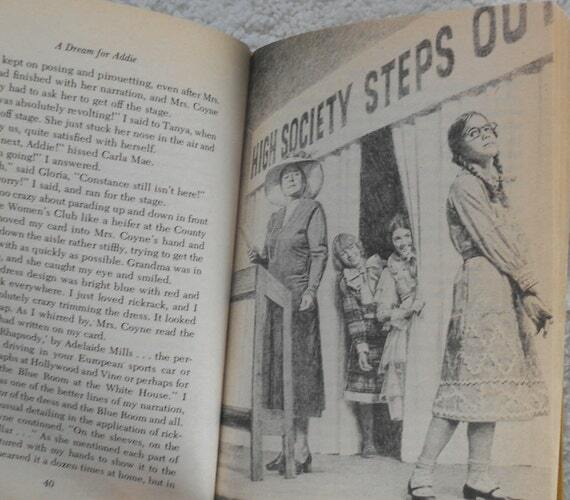 Inside the front door was a desk, with someone there to hand me a form and assign me a shopping attendant. The form and the staff wanted to know about the bride, not about me. 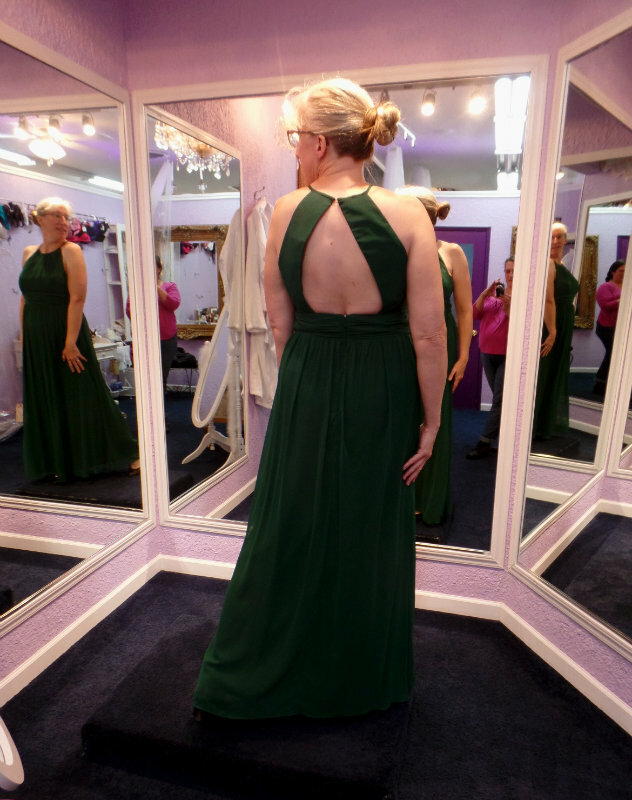 I kept saying things like, “Well, yes, that is her last name too, but she’s in Colorado and already has a dress.” The idea that a lone attendant would walk in hoping to buy one dress, for herself, seemed foreign to them. We were assigned a fitting room, which was spacious but had no mirrors inside it at all. To see yourself, you have to step out into the hallway between the fitting rooms, so the sales staff and your bridal party can weigh in. There’s also a little stage which had three honest-to-god pedestals to stand on, plus mirrors and a few rows of folding chairs for the audience. I watched a girl try on a First Communion dress complete with veil; she looked absolutely delighted. Business was hopping at this place too– I asked the woman at the desk why now, and she said it was everyone who’d gotten engaged over the holidays. The week or two after Valentine’s Day will also be frantic, she said. The dress I’d spotted online didn’t work out, so we tried a few more. The woman in the next fitting room was trying on puffy wedding dresses, and the stash of them on the clothes-rail outside her door got wider and wider until Sang and I were pretty much barricaded into our room by foofy white fabric. Also, whenever anyone in the store decides on a wedding dress, a bell rings (clangclangclang, like at Trader Joe’s) and everyone cheers. It was in the Mother of the Bride section, but whatevs. I guess I’m old enough that I could be the mother of a bride. (Though that model doesn’t look like she could.) It feels simple and comfortable. It’s a little darker blue than I’d hoped for, but there are slightly lighter blue and purple beads at the waist. And, Sanguinity offered to knit me a lace stole in a coordinating brighter shade! That will redeem the dress from its navy tendencies and also come in handy in May in the mountains. We picked pattern, yarn, and beads when we got home. Victorian Lace Today, you are a wonderful book. So thanks, Shellynoir, Bookherd, Marian, and Refgoddess, for your interest and assistance! And of course thanks to Sanguinity, invaluable shopping advisor. It may not be her favorite thing to do, but man is she good at it. Now as I go around town and pass clothing stores, I don’t have to ask myself, “should I go in and look for dresses?” Ahhh. Yesterday was blech, and there’s not much I mind consigning to the abyss of forgetfulness. But I did indulge in something I very rarely take part in: retail therapy. These are Step One in my long-planned New Look. (My Old Look involves past-their-prime running shoes.) I put them on in the kitchen yesterday when Sanguinity and I were cooking. “I feel like Harriet the Spy!” I said. Step Two requires a trip to Sock Dreams. Let me know if you want to go too! Especially after a weekend of commercial television at the in-laws’, I do see how shopping can keep the feeling of disappearing at bay, and instill a sense of triumph and participation instead. Not as good as making stuff, but easier.